Can you ever have too many cupcake recipes? Never! Here’s one that I’m so excited I’ve gotten around to trying. I finally bought a kitchen torch about a year ago but I can’t believe I haven’t posted any creme brûléed desserts yet. 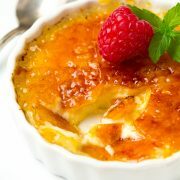 I love creme brûlée and the way its sugar coating nearly instantly caramelizes thanks to those ingenious kitchen torches. I almost feel magic :) as I watch the sugar melt into tiny round beads, then spread and rapidly change from a soft white to various vibrant colors. 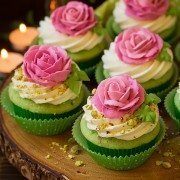 If you are like me and love French pastries then you’ll adore these cupcakes. 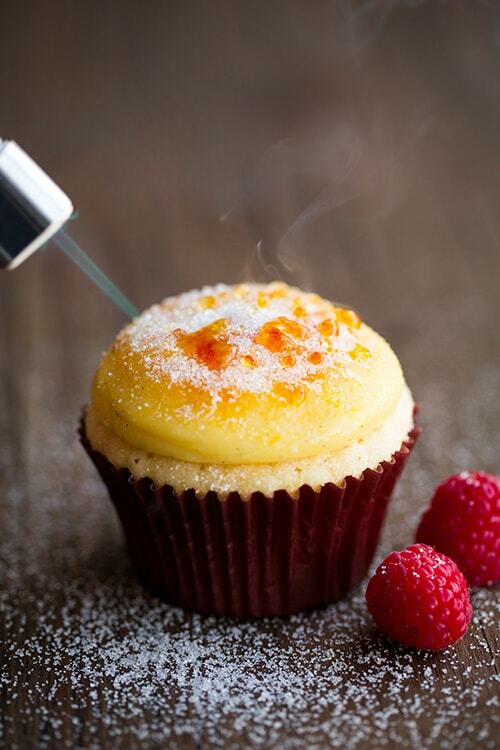 Not only do you get a delicious homemade cupcake but you also get a rich, vanilla bean pastry cream topping that’s generously coated with sugar and brûléed to a crisp and crunchy perfection. To take a fork (or to skip the fork, because who needs it when you’ve got a cupcake this good) and break through that toasted sugar shell, into a lush pastry cream and through a fluffy cupcake is utter bliss I tell you. The textures, the flavors and just the simple elegance of this cupcake with have you smitten. It is definitely a must try cupcake! Enjoy! One of the most tempting decadent cupcakes you'll ever make! 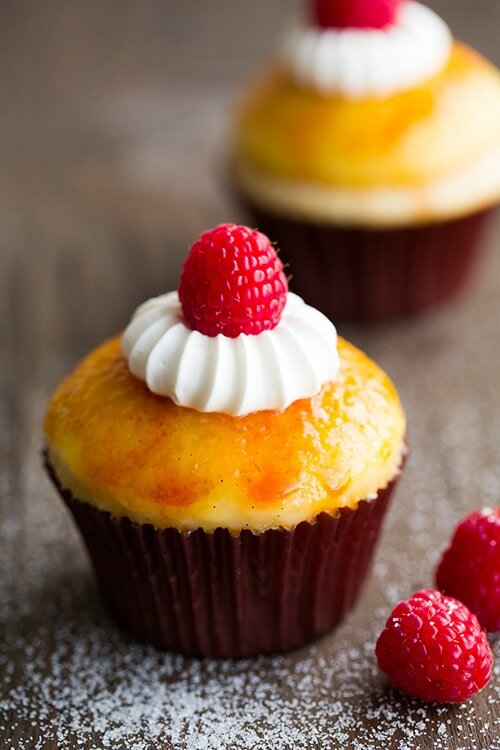 Two of the best desserts collide, luscious caramelized creme brulee and soft tender cupcakes, for a treat no one can resist! 1/2 vanilla bean I sell them! In a medium saucepan, heat heavy cream, milk, 6 Tbsp sugar, salt and seeds of 1/2 vanilla bean along with vanilla bean pod over medium heat. Bring mixture just to a gentle bubble, stirring occasionally (remove from heat as necessary to prevent vigorous boiling while preparing remainder). Meanwhile, in a mixing bowl, whisk together egg yolks and 2 Tbsp sugar until well blended. Add cornstarch to egg yolk mixture and mix until very well combined and and slightly pale and fluffy. Take about 1/2 cup of the hot cream mixture from pan, and while vigorously whisking, slowly pour hot cream mixture (about 1 Tbsp at a time) into egg yolk mixture. Reduce burner temperature to medium-low. Then, while whisking hot cream mixture in saucepan, slowly pour egg yolk mixture into hot cream mixture in saucepan. Cook mixture, whisking constantly, until thickened (allow it to boil for about 30 seconds to cook out starchy flavor). Immediately force mixture through a fine mesh strainer into a bowl. Mix in 1 Tbsp butter. Cover with plastic wrap pressing directly against surface of custard. Chill thoroughly, about 2 hours. Preheat oven to 350 degrees. In a mixing bowl, whisk together flour, baking powder and salt for seconds, set aside. In the bowl of an electric stand mixer fitted with the paddle attachment, whip butter and granulated sugar until pale and fluffy. Mix in egg then blend in egg whites and vanilla. Add 1/2 of the flour mixture and blend just until combined, then add milk and blend just until combined and finish adding in remaining 1/2 flour mixture and blend just until combined. Divide batter among 12 paper lined muffin cups, filling each cup about 2/3 full. Bake in preheated oven 21 - 24 minutes until toothpick inserted into center of cupcake comes out clean. Transfer to a wire rack to cool completely. Pipe or spread chilled pastry cream over cooled cupcakes into an even layer. Working with one cupcake at a time, sprinkle entirety of pastry cream with sugar then heat with a kitchen torch until sugar begins to melt and caramelize*. Allow topping to cool then garnish with whipped cream and a raspberry if desired. 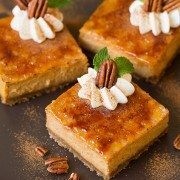 Serve immediately (note: the pastry cream can be made the day before and the cupcakes can be made hours ahead of time but top with sugar and caramelize sugar just before serving). *I would first coat the edges of pastry cream while rotating the cupcake, then sprinkle tops, then I would torch it and add another layer of sugar. I just found working in layers worked best so it didn't all bead up and just run off the sides, but just experiment and see what works best for you. I used about 1 - 1 1/2 tsp sugar per cupcake. ACDLV: The cakes, delicious, firm very Nice mouthfeeking not sticky not dry also without topping eaten by family. I made them without the vanille extract because of allergie. Topping was very runny still after 24 hours… but as I am told mouthwatering delicious (only with the vanillla bean). Lisa Kaufmann: I can’t wait to try them out.